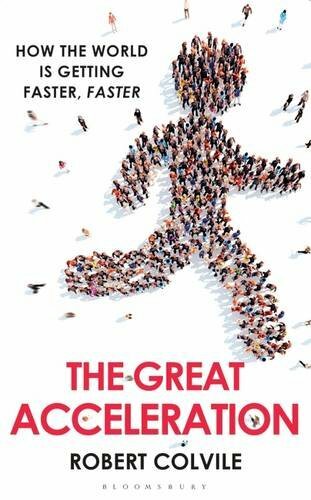 I'll be appearing on 'Start the Week' with Andrew Marr tomorrow morning, in the first stage of the publicity campaign for 'The Great Acceleration'. The topic is 'Is Faster Better? ', and the panel includes Carl Honoré (author of 'In Praise of Slow' and 'The Slow Fix'), Prof Steve Jones (veteran science writer and author of 'No Need for Geniuses', about scientists and the French Revolution) and Sarah Dunant (author, critic and general literary/historical expert). This is, obviously, mildly terrifying, but I'm looking forward to the discussion. I also gave my first talk about the book over the weekend, at the Cambridge Union - it was part of 'ThinkCon', which in turn was part of the Cambridge Science Festival. There was a decent, interested crowd and I hope I made some interesting points. I also sold my very first copy of the book. To my brother-in-law. Baby steps, eh?